HP has jumped into Chromebook’s with a vengeance. As one of the largest PC makers in the world, they have the scale and facilities to churn out models quite quickly and they’re doing so with their Chromebooks. It’s a good sign that Chromebooks have enough traction to warrant so many iterations of ChromeOS based notebooks and we’re always happy to see more. The HP Chromebook 11 got a sneaky launch, it showed up in a JB HiFi store back in mid-May, when they sold one to a customer looking at the previous model. It took a while for HP to officially acknowledge the new Chromebook 11 (I’ve never understood why companies deny the existence of something in a customers hands), but eventually they did and we now have the HP Chromebook 11 selling for $399 in a variety of Aussie retailers and HP have kindly supplied a review unit to take a look at. So, how does the HP Chromebook 11 fare? Hardware wise, the Chromebook 11 has the same Specs as the previous model, packing the same Samsung Exynos 5 Dual (1.7 GHz) processor, 2GB DDR3 RAM and 11.6″ HD LED-backlit 1366×768 resolution screen, it even has the same sized 16GB SSD inside. It’s a pretty stock hardware spec for Chromebooks these days, although with an ARM based processor, instead of the newer Intel Bay Trail processors which other OEMs are currently looking to release. The HP Chromebook 11 is not pushing the boundaries of hardware specs, but that seems to be the status quo with Chromebooks, so, it’s all coming down to design. HP Chromebooks have been updating quite quickly. It’s not a bad thing, they’re refreshing the design with each iteration, this time updating their 11¨ model Chromebook to the look of the current model HP Chromebook 14 which we reviewed back in March. The explanation of the change is that the Google Chromebook 11, is just that – a Google Product. 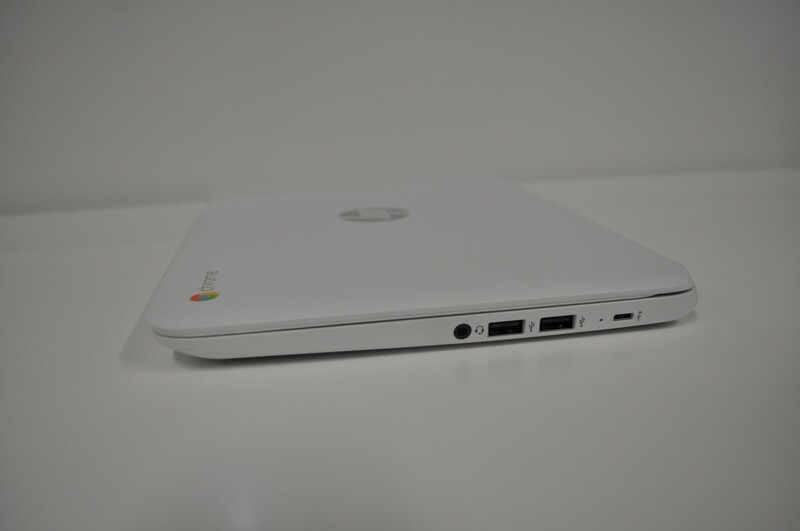 The HP Chromebook 11 is a HP product. It’s designed and manufactured by HP to be their Chromebook, but you will be getting the same specs that Google deemed worthy from the previous model. Design wise, it literally is a shrunken version of the Chromebook 14. It has the same textured base, although the port placement and speakers have been moved around. The shrunken form factor though has changed from the more pleasant wedge shape on the Chromebook 14 to a more rectangular block due to the limited room. 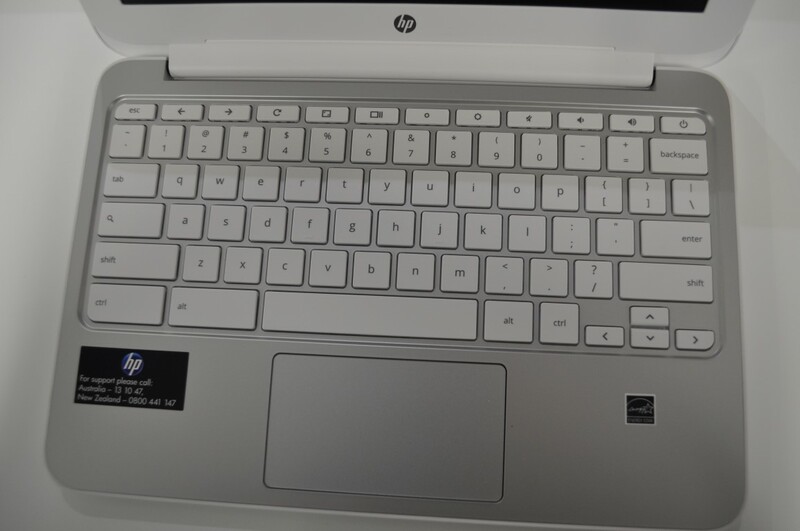 HP Chromebooks are very much unapologetically plastic. It’s a material they’ve used to make their millions of widely used laptops over the years and it works. The plastic isn’t generally going to win any prizes for looking great, but it’s functional and the plastic on the Chromebook 11 has a matte finish to it which makes it easy to pick up and carry if needed. The keyboard is surrounded by a silver, almost metallic feeling plate, which breaks up the white of the review unit while its open and the keys on the keyboard stand out quite nicely. In terms of build quality, it’s a HP. The Chromebook is quite well put together, the hinged screen opens and closes well and feels like it’s designed to last. There’s slight issues such as the off-centre touchpad, but that’s just getting picky and most likely varies model to model. 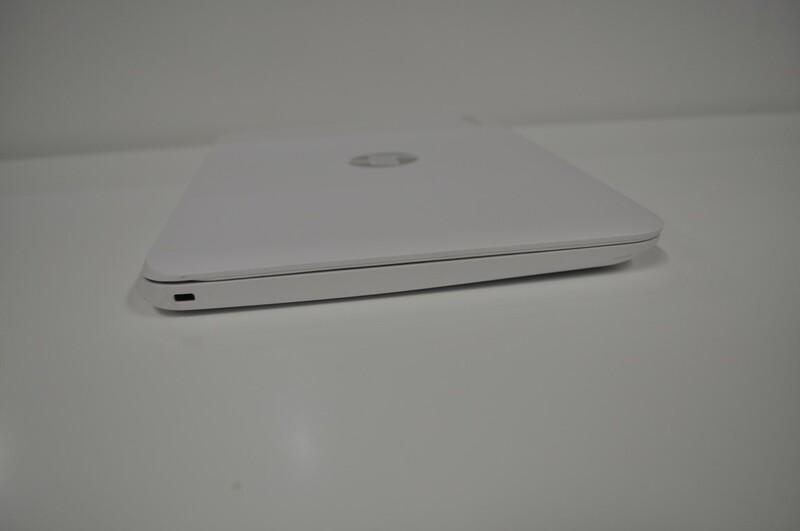 The Chromebook 11 has an 11.6″ LED-backlit screen with a 1366×768 resolution. It’s not a terrible screen, it seems fine under the glare of a fluorescent light office environment and it works quite nicely in a cafe, when you’re sipping your latte in the fresh, bright, morning air. The shared graphics listed on the HP website, is most likely the Mali-T604 GPU which is normally paired with the Exynos 5250 SoC. It handles graphics on ChromeOS with no issues, but there’s not a terribly large amount of graphically intensive apps, utilities or games on ChromeOS…for now, wait till Android App integration, which Google announced at I/O starts rolling out and we may start seeing a need for higher end GPUs on Chromebooks, that said, the Mali-T604 GPU certainly works fine on Android devices so should be relatively Ok.
On an 11.6¨ screen, the 1366×768 resolution is actually quite pleasant, but lets face it, it’s really getting down to the point where manufacturers are going to have to start looking to 1080P screens. Perhaps next years release. Chromebooks have pretty much all come with a very nice to use chiclet-style keyboard, the Chromebook 11 is no different. The keys are responsive and bounce back easily. While the keyboard is nice to use, the touchpad leaves something to be desired. To start with the touchpad is off-centre with a large gap between the right hand side of the touchpad and the base, I’m being picky, but that’s the point, I visited a few stores to see if this was the case on more models, and it seems that it’s a luck of the draw thing, with some having this issue and others centred correctly. The touchpad, like the rest of the Chromebook 11 is plastic, in actual use it’s decent, response was ok and while it’s not a patch on the simply lovely Chromebook Pixel touchpad, it’s going to work when you need it to. The Chromebook 11 comes with the bare minimum of physical connections – 2 USB 2.0 ports and a single 3.5mm jack that acts as a headphone/microphone combo port. It has a micro-USB port for charging and all by itself on the left – a Kensington Lock. Wireless connections though you get the expected WiFi 802.11a/b/g/n and Bluetooth 4.0 that come on every laptop or Chromebook these days. Bluetooth works fine, connecting to Wireless mice, headsets and keyboards. WiFi similarly works well connecting to routers without issue. Just as the Chromebook 14 had a set of base mounted stereo speakers, so does the Chromebook 11. Again, the positioning of the speakers means that they’re fairly muffled when on your lap, although the rubberised feet on the base lift it just enough while working on a desk to hear fairly clearly. If you want the best performance sound wise from the Chromebook 11, then plug in a pair of headphones, they work flawlessly. Chromebooks have the distinction of having a fairly good hardware compatibility, offering ARM models as well as x86 CPU support, with the Chromebook 11 you get a Samsung manufactured Exynos 5250 SoC paired with 2GB of RAM, and quite frankly the performance hasn’t changed since Chris checked out the previous version back in February. With 2GB of RAM, you’re completely fine until you hit around a dozen tabs or so and then you feel the machine start to chug, in fact a reboot is often required to really get it back to running snappily. While it’s uncommon for me to really have more than say 4-5 tabs open on a Chromebook – their sometimes limited functionality are ideal for focusing you on the task at hand – but when you’re faced with surfing somewhere like reddit, it’s not uncommon to bulk load links to check out and that’s when you’ll hit the wall. The HP website is unclear whether the 2GB can be upgraded to 4GB, simply stating that Memory maximum is ‘Upgradeable to 2 GB’. We asked HP and they advised that the maximum RAM allowed in the Chromebook 11 is 2GB. The Chromebook 11 is a novelty, like its predecessor it has a microUSB charger, which is a life-saver for anyone who has travelled. Simply take along one charger and you can use it for your phone as well as the Chromebook. It’s a great idea, but does seem to make charging times a little longer than just using the old proprietary charger. That said, if you need a new charger, picking up a microUSB charger with a 3.0A output to replace it could be just as difficult as buying a proprietary charger. Battery life on the Chromebook 11 is pretty decent, you’ll get about 5, maybe 6 hours out of it if you’re not watching too many videos. It’s not bad, but could be better but obviously the form factor of the unit dictates the size of the battery. Just something to be aware of. Hah, it’s ChromeOS, so you’re running the same version of ChromeOS as just about every other Chromebook, Chromebox or Chromebase on the market. You will be prompted to update ChromeOS straight out of the box, but it’s a relatively – compared to updating a Windows machine – pain-free experience. Currently, the Chromebook 11 is on Stable version: 36.0.1985.143 and Beta version: 37.0.2062.80 – there are sometimes differences between ChromeOS devices but the Chromebook 11 seems to be fairly on par with other devices and looks to remain that way for some time. While you will eventually find your Chromebook at end-of-life, the HP Chromebook 11 is scheduled to receive updates until the 18th of October 2018, so you’re set for a few years at least. It’s hard to be super impressed by a new model Chromebook which has exactly the same specs as the previous model. 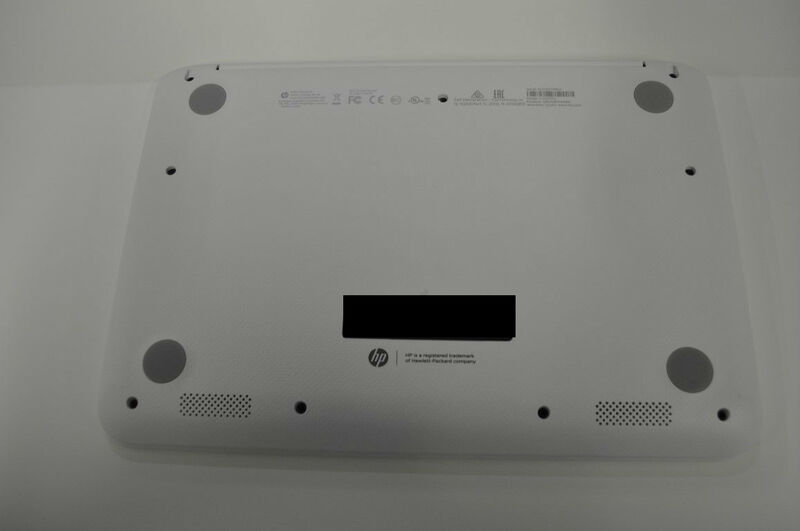 HP makes some great equipment, we know why they’ve updated the design but it’s still a little confusing to release it without at least changing some of the hardware. It comes down to whether you like the look of the previous Chromebook 11 to the current one, or if being a ‘Google’ product means something to you. There’s some interesting colour highlights on the previous one and a funky plastic shell box, while the current model comes in a tasteful white or teal colour options. If you’re after a Chromebook in the 11¨ form factor, then you’re effectively going to be looking at either of the two HP Chromebooks. Dell has still not released their 11″ Chromebook in Australia, so you’re stuck for choice if it’s 11″ you’re after. If it’s performance you want then you’re really going to have to look elsewhere, the inability to upgrade the RAM makes the Chromebook 11 a fairly limited option. At $399 ($347 if you go to JB Hifi) it’s a pretty expensive option. Still, if it’s 11″ you have to have then this is the one for you. School bought nearly 50 of these. Huge issues with the i/o board and they stopped charging and needed the board replaced, and then many of the chargers also failed, along with some motherboards and had to be replaced.Contacted a HP person in Wellington (David) who was really supportive and has organised fixing them – now part way through the process of repairing them. Having said that, I wouldn’t recommend this model – new models have a different charging port (not micro usb) so maybe the design fault has been addressed. That’s bad news to hear Peter. At least HP is making good, but yeah, these models are now quite dated and we agree, they probably shouldn’t be bought now.